Lions 2017 v Transvaal 1993: who’s better? Durban - Curwin Bosch is going to use the Currie Cup to focus on developing as a flyhalf. That was the word from Sharks assistant coach Sean Everett at the start of the build-up to what will be a frenetic week for the Durban union, who play Griquas in Durban on Friday night, the Blue Bulls in Pretoria next Wednesday followed by the Lions in Johannesburg three days later. Bosch was switched between fullback and flyhalf during the Super Rugby season before ending the campaign with the No 10 on his back in the quarter-final against the Lions. He also spent much of the last Currie Cup season in the last line of defence, with coach Robert du Preez being in line with the view of his predecessor Gary Gold that an apprenticeship at fullback would be good for his development. 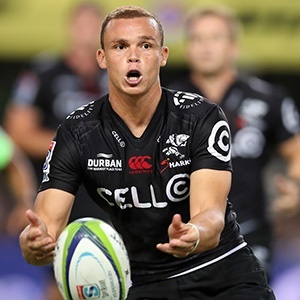 However, most of the Sharks’ best performances during an inconsistent Super Rugby run came with Bosch at pivot, and Everett says that the Sharks will now look for continuity in that position by keeping Bosch at flyhalf. “During Super Rugby we were disrupted with Curwin being called up to do duty with the South African Under-20 side at the Junior World Championships and Inny Radebe was injured,” said Everett. It is a largely forgotten fact now that the Sharks actually started the season with French international fullback Clement Poitrenaud expected to be the first choice. However, although he is an experienced player, Poitrenaud’s move to Durban never quite worked out - he just never made an impact and was also injured - and the discourse over who plays flyhalf in the absence of the injured Patrick Lambie has of necessity been impacted by the gap left at No 15 by the departure of Springbok Willie le Roux. Garth April and Bosch have interchanged between 10 and 15, and Ryno Smith also played fullback for a while, but for now it looks like it will be Bosch at flyhalf and April at fullback. The Currie Cup is a good time for Bosch to get an extended run in his preferred position before next year’s Super Rugby. Read the story on SuperSport.com.